People actually made these. On purpose. 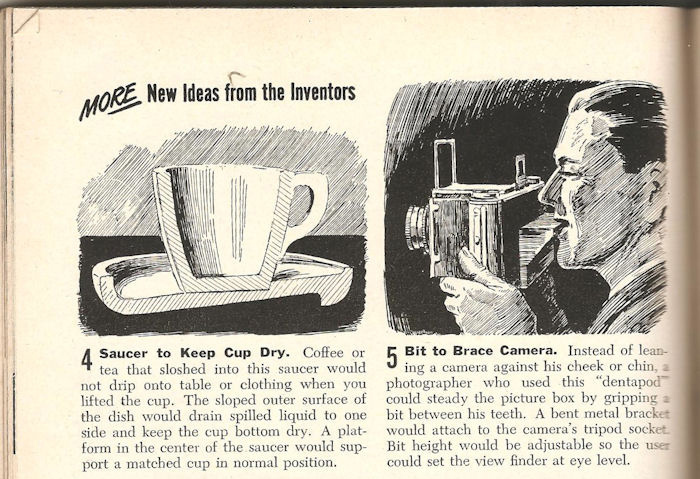 Someone on Reddit found this gem from an old edition of Popular Science magazine dating back to 1954. Basically, if you’re tired of having to use artificial means like a tripod to keep your camera steady, like some kind of savage, then this nifty metal plate would allow you to do so using your teeth. This appears to have never caught on. Something a bit more modern now – in 2013, inventor Steve Hollinger was granted a US patent for Squito, the throwable panoramic camera ball. 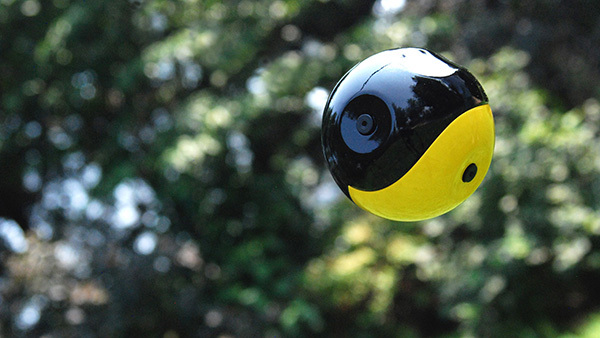 You throw the ball, and it uses positional sensors and embedded cameras to take a series of images of its flight trajectory. These can then be processed into a panorama, assuming you didn’t accidentally roll the camera into the middle of a busy road or a nearby ravine (to be fair, you shouldn’t have been using it there anyway). After several attempts at aerial photography in the late 1800s, inventor George Lawrence hit on the idea of the ‘Captive Airship’ in 1901. 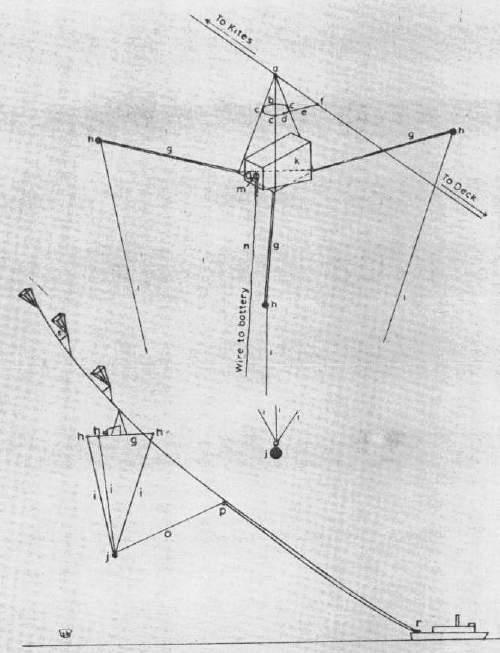 Consisting of 17 kites strung together with piano wire, this monstrosity was capable of suspending a 50-pound panoramic camera in the air. 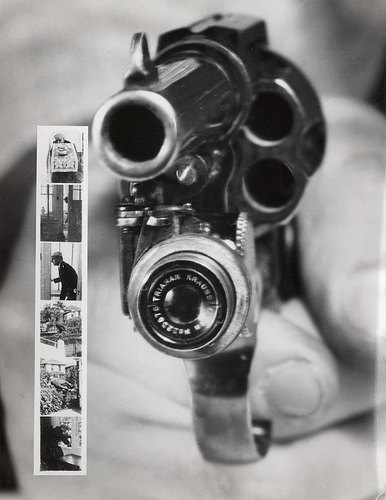 Back in 1938 New York, a camera that was also a gun was deemed a legitimate thing that people might want to use. So someone invented one – this Colt 38 carrying a small camera that automatically takes a photo when you pull the trigger. Image: Bundesarchiv Bild 183-R01996, Brieftaube mit Fotokamera cropped via Wikimedia Commons. Turns out pigeon photography has a long and illustrious history, enough to merit its own Wikipedia article. 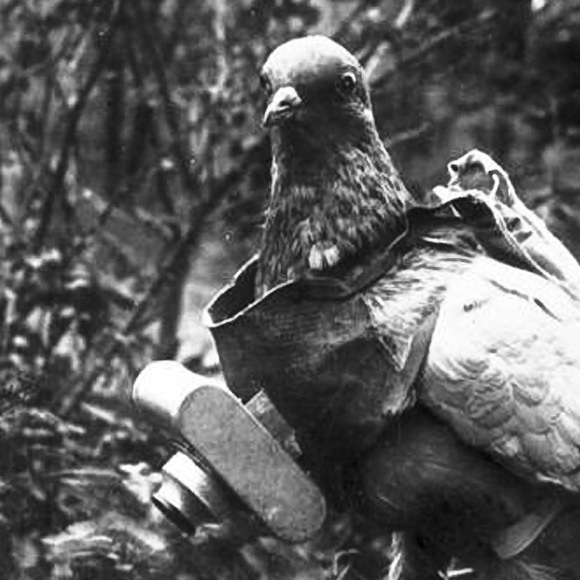 Apothecary-owner Julius Nebronner came up with the idea of a specially designed pigeon camera after one of his pigeons disappeared for four weeks and he was curious to know where it had gotten to. The result was a fascinating array of leather and aluminium that could take a time-delayed photograph via a pneumatic system.